If Norway’s on your radar, you’ve surely been asking yourself – where to take the best photos in Norway? And what to do once you get there? We take you on a virtual journey to one of the most beautiful countries in the world. I’m not the kind of guy that easily falls for photos of places, especially with all the post-effects and photoshop everybody seems to add to their pictures after taking them, but one thing’s for sure – I felt in love with Norway while writing this article. Get comfortable and ready to be amazed by the land of spectacular scenery, architecture and really happy people (according to the World Happiness Report). 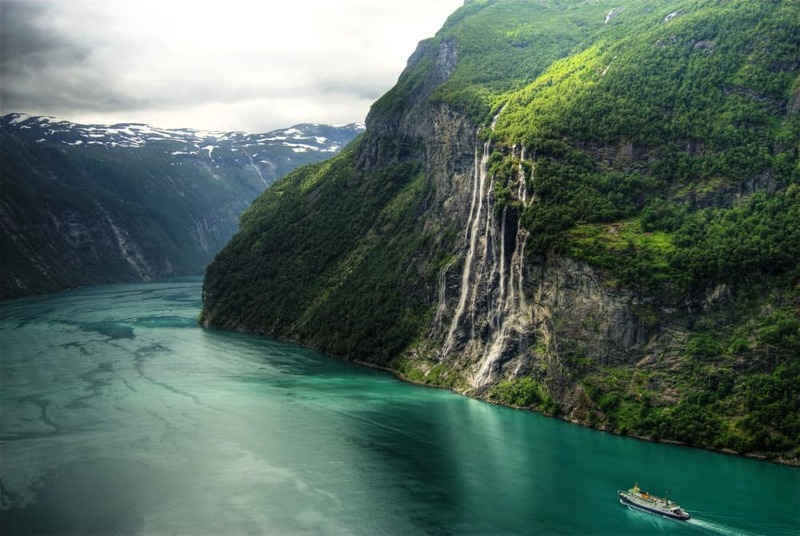 Situated in the Geiranger fiord, that’s amongst the world’s longest and deepest, the Seven Sisters Waterfall consists, as you have guessed, of seven separate streams, with the biggest of the sisters measuring a free fall of 250 meters. The Sever Sisters are just across from another famous waterfall called Friaren (The Suitor). It’s best to visit the site when the water levels are high to see the powerful streams, usually between May and July, during the major snow melting period. 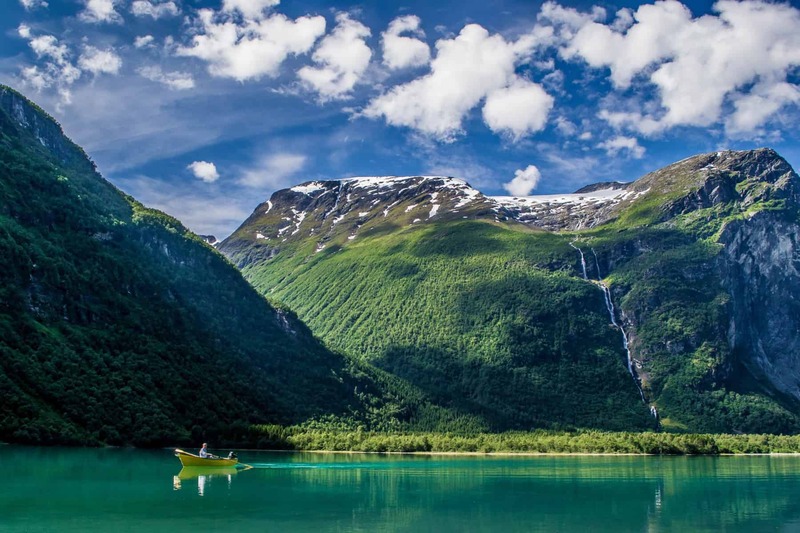 You can see both the opposing waterfalls by taking a boat trip on Geirangerfjord. A summer midnight sun in Reine, Lofoten Island. This would look great in a frame on your wall, but first, go take such a photo for yourself! – Experience the midnight sun, and even play golf during the night, thanks to the continuous sunlight. – Watch the northern lights between September to April. – Go rafting in the Trollfjord. – Rent an old fishermen’s cabin called rorbuer, these have been restored and offer great accommodation. – And of course, go fishing or paddle a kayak between the islands. 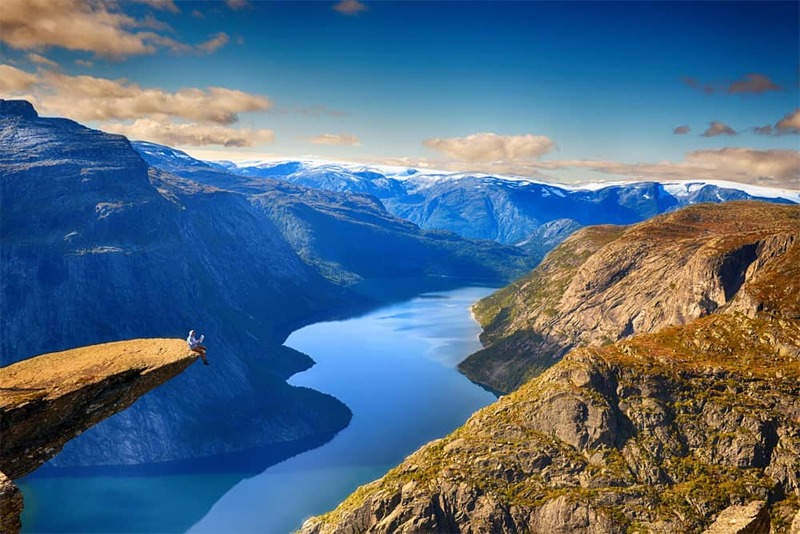 The Troll Tongue is a natural piece of rock hovering 700 meters above lake Ringedalsvatnet in the south-west Norway. 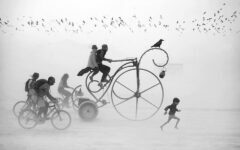 Can you imagine all the amazing photos you can take here? 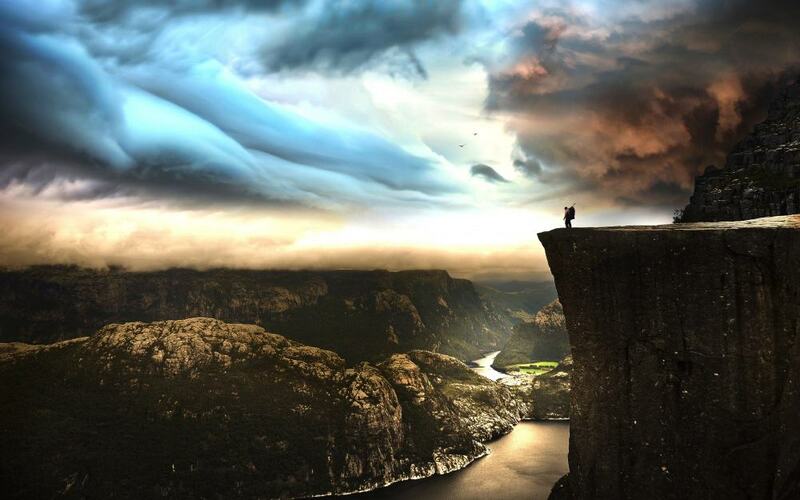 Like the guy in the photo above, reading his morning newspaper on Trolltunga’s edge. How about you in your swimsuit, sunbathing, or having a romantic dinner or picnic? The photo possibilities are endless, just use your imagination. It takes around 5-6 hours to hike as there are around 11,5 km to Troll’s Tongue. When planning, don’t forget to add the way back to the plan. You can visit it from September to June and go prepared or just don’t. This also includes physical training before taking the hike, it’s not an easy trail! But once you’ll get there, the breathtaking view will make it all worth it. Lodalen valley offers scenic views wherever you look. The crystal clear lake and the spectacular mountains surrounding it will make your photos look like postcards! If you ever wanted to see a glacier, Lodalen is the home to the most easily accessible one – Kjenndalsbreen. You’ll also love lake Lovatnet that has a unique green color thanks to the rock dust and clay particles. It becomes even greener when the glacial water reaches the lake. 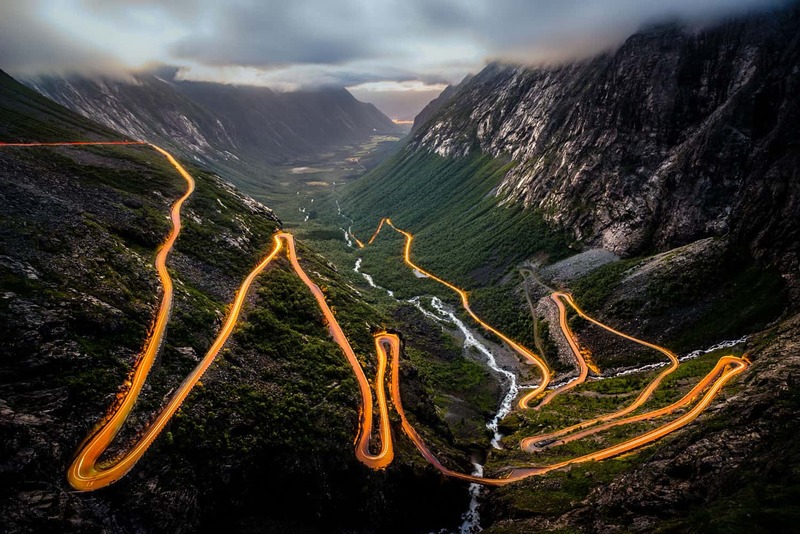 Trollstigen is a 106 km long serpentine mountain road in Rauma Minicipality, built in 1936. Ever since, the steep road has been a magnet for tourists from all over the world. If you’re worried you’ll get carsick just think about the many observation decks built along the road that you can stop at. And all the stunning places to take photos you’ll encounter on your way. And here’s an unconventional way to take advantage of the splendour of Trollstigen. Being destroyed by a fire in 1904, the city was rebuild from ground up in Art Nouveau style. Alesund sure looks like the Venice of Scandinavia, but that would not be the best description for this lovely town. 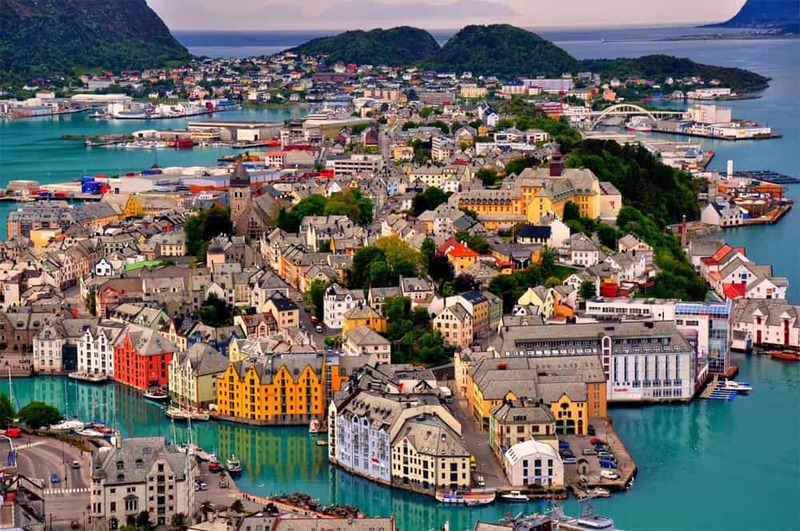 The most complete and harmonious Art Nouveau town of Scandinavia outlines Alesund much better. Surrounded by clear blue water, this colorful city has a lot of spectacular views to offer, in and out of it, just make sure you have enough film in your camera. Sorry, memory card space, thought the film nostalgics would appreciate it. The point is you’ll want your digital photos took in and around Alesund printed. It’s a great place to take photos! 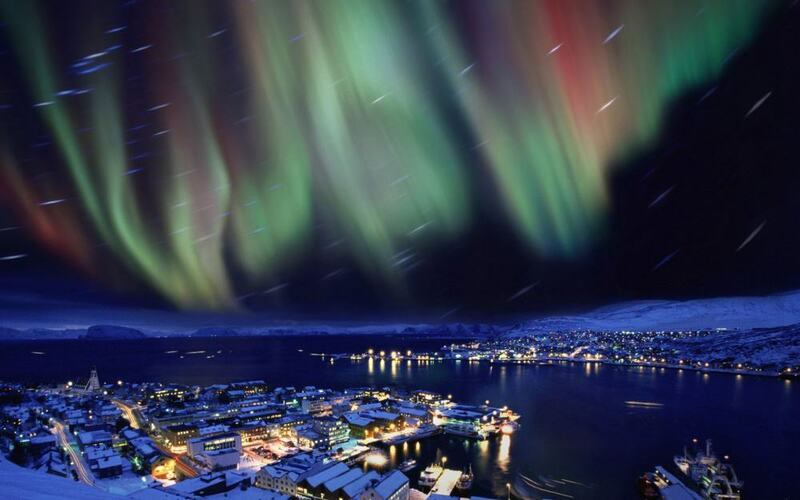 Hammerfest, a place Aurora Borealis feels at home. Considering it’s an arctic town, Hammerfest is full of life and offers great outdoor adventures. 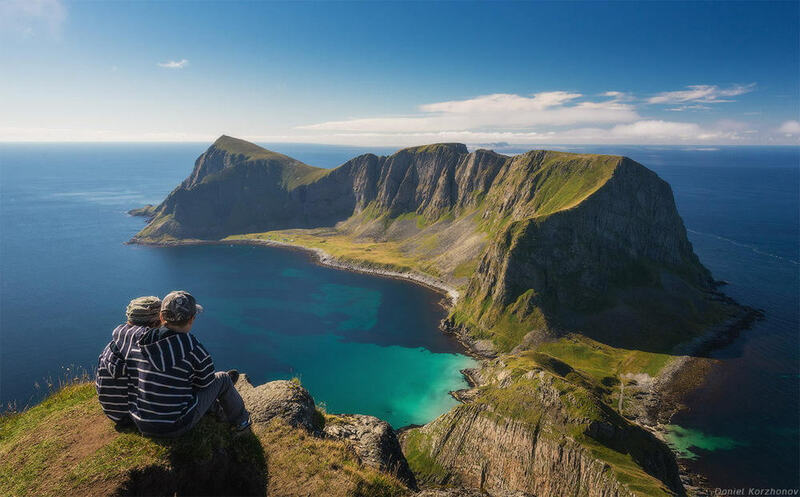 Situated in the middle of the uninhabited northern coast of Norway, the city offers exactly what an avid photographer is looking for – mountains, sandy beaches and impressive coastal landscapes. 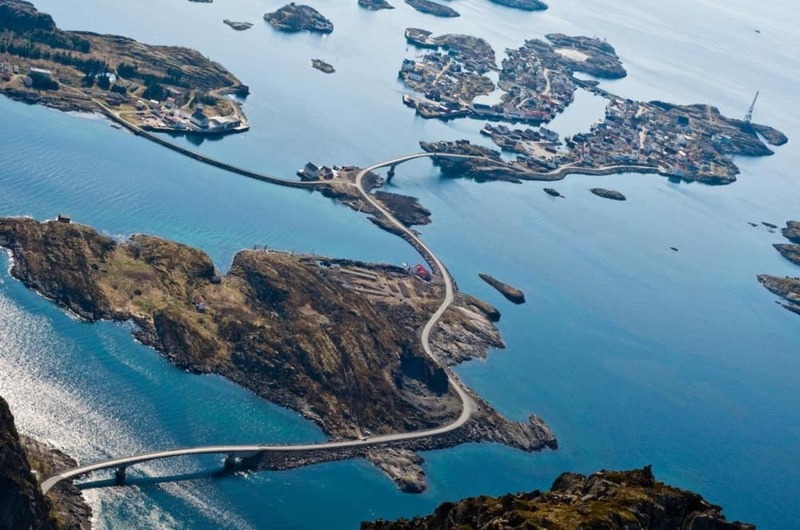 Drive on the ocean’s edge – the Atlantic Road. Go from island to island, by car, on this fantastic road that was voted Norway’s Engineering Feat of the Century. As almost any other picturesque places listed in this article, the Atlantic Road is filled with observation decks, perfect for taking great photos. The road is only 8,3 km (5.2 miles) long, but according to The Guardian, it’s the world’s best road trip. During winter, the Atlantic ocean gets pretty rough, but I’ll let the following video better explain what you might go through. The internet is filled with photos of this “drunk bridge” as Norwegians call it or “the most frightening bridge” in web culture. One thing’s for sure, it is scary! Looking more like a ramp when viewed from the road before it, everyone’s that has been on it agrees it’s just an optical illusion. 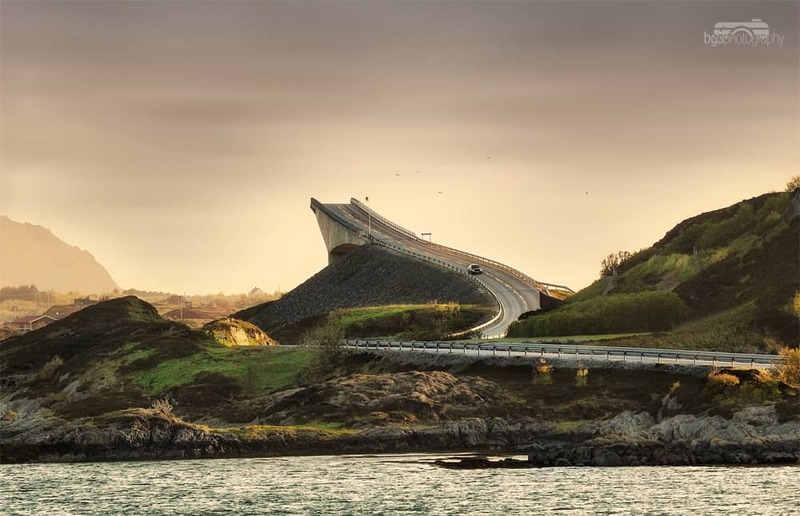 The Storseisundet Bridge is part of the above mentioned Atlantic Road, being the longest from a total of eight bridges. There are several stops you can take advantage of, before and after the bridge, spots you can take out your camera and snap some pretty impressive pictures. Another Norway city north of the arctic circle which means it’s a great place to watch the northern lights (from September to March). 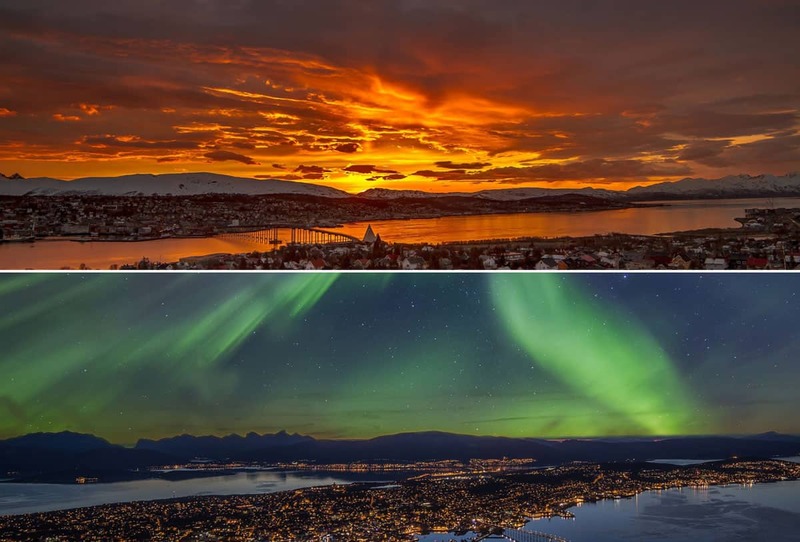 It also means Tromsø has no night between 20th of May and 20th of July, and you can enjoy all sorts of activities around the clock, under the midnight sun. And there are lots of things to do, as it is packed with restaurants specialised in fresh ingredients of the Arctic and has a vibrant nightlife scene. Beside what’s pictured here, Lysefjord offers more picturesque spots like waterfalls and idyllic islands. 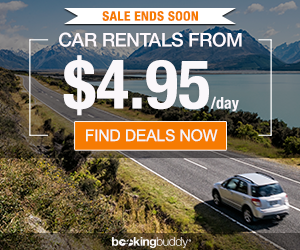 A fjord that offers stunning views, whether you want to hike (you must be prepared and fit to do so) or just drive. It is 40 km long and the mountains surrounding it reach over 900 meters (3000 feet) above the sea level. 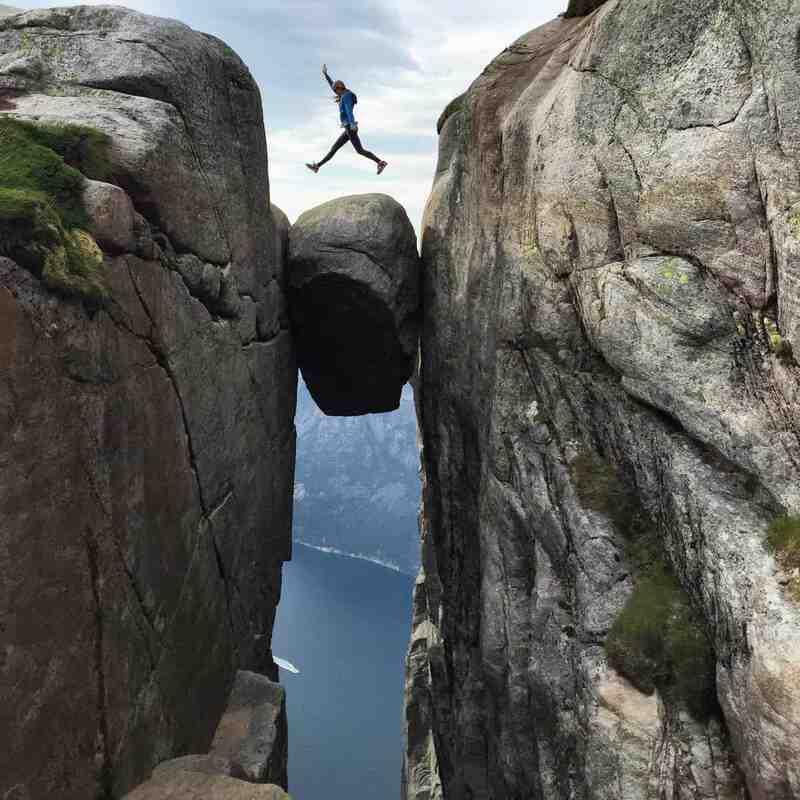 You can actually get up there, on viewpoints like Kjerag, Pulpit Rock, Bratelli and Flørli – incredible places to take photos, we’ll talk about them further on, all of them being the perfect photo op. The hike to Kjerag climbs 570 meters and takes around 5 hours. The Kjerag peak rises at 1084 meters and offers jaw-dropping views from its plateau. But without a doubt, the high point of the trip is to snap a photo of you on the Kjeragbolten, a 5 cubic meter boulder wedged in the mountain’s crevasse. Kjeragbolten is now like a Mecca for hikers that love to take great photos, and the best thing is, that’s not the only wonder you’ll get to see when you go in Lysefjord, Norway. 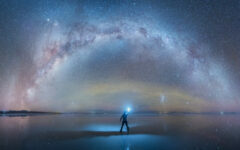 This would make one of the best photos you’ve ever shot, wouldn’t it? This is one of lesser known fiords of Norway, so if you feel adventurous and want something off the beaten path, this is the place to go! We’ll just share one of the amazing things you’ll discover, a swing with a stunning view. The imposing Innerdal Tower watching over the splendid Innerdalen Valley. When you say Innerdal Tower most people will think it’s the latest and tallest skyscraper downtown. Happily, that’s not the case here, Innerdal tower is a majestic mountain watching over the Innerdalen valley that’s said to be Norway’s most beautiful. After parking your car, you only have to stroll for 4km to get to the heart of this heaven-like valley. You can then take any of the marked paths that will take you into the mountains and uncover an old farm with grass covered roofs where you can have traditional food and can even stay for the night. Can you imagine it? Storytelling by the fire before going to bed in that fresh air of the mountains. 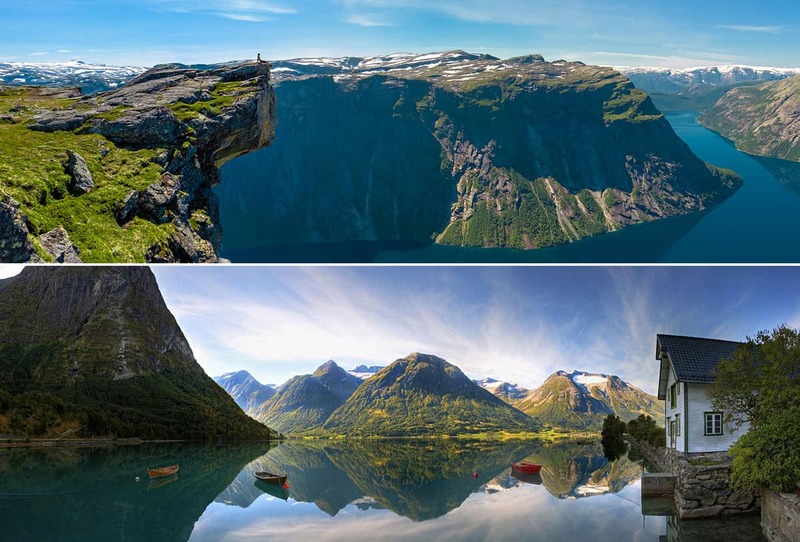 Crystal clear lakes, glaciers, cascades and traditional farms – the best place to take photos in Norway? Just one of the many, as you’ve seen, and our journey is not over yet. Although the Lofoten Archipelago is within the Arctic Circle, the climate here is surprisingly mild, temperatures during winter averaging 0°C (32°F) and 13°C (55°F) during summer. You can also find other world wonders in Lofoten, like the biggest deep water coral reef on our planet. During July and August the sun doesn’t set but keeps hovering over the sea so you’ll feel like in a surreal place, making you lose track of time and days. While if you love sunrise and sunsets, you should go there in January when the sun is in a long sunrise and sunset. 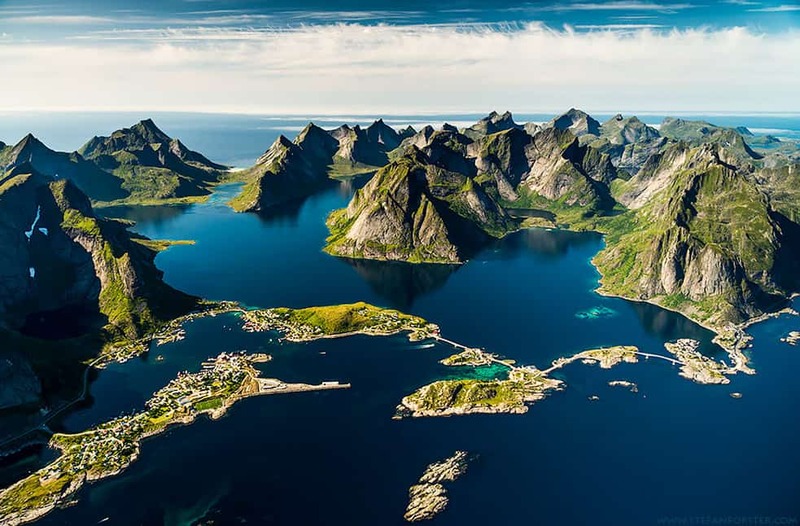 Filled with narrow fiords, western Norway still keeps the marks a succession of ice ages left behind, a realm made of waters filled with seals, whales and fish cutting through high, spectacular mountains. Not far away from Norway’s largest cities, you can quickly trade the busy and vibrant urban life for the quiet countryside and explore the great wilderness. The Fjordland will make you trade land for water and start exploring the landscape by kayak, or even scuba-diving. 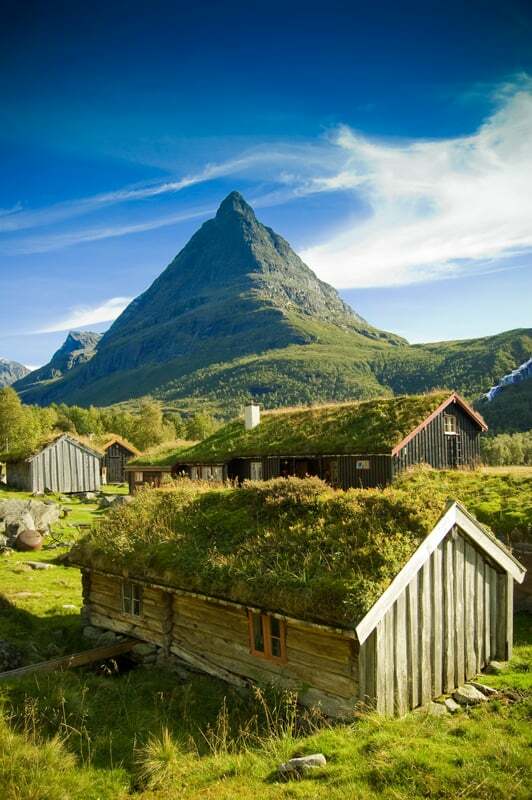 More things to do and to see on Fjord Norway. Petrolheads, this one’s for you! Sure, we all love nature and great scenery, but Norways’s got something up its sleeve for the motorsport fans. How about racing on a frozen lake, mastering the art of drifting? 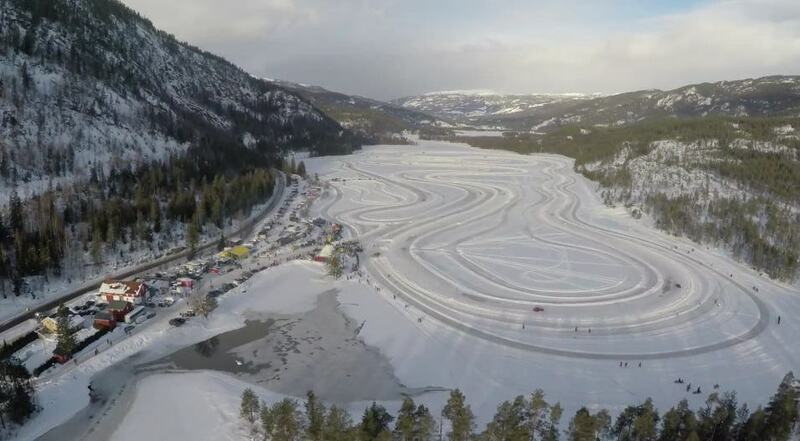 Each year, Gatebil on Ice is hosted on a frozen lake in Sigdal. Just get there and register and you’ll be allowed to drive as much as you want on this track. One of the outermost of the Lofoten Islands, Værøy is dominated by a long mountain ridge. You can get there by helicopter from Bodø – imagine all the aerial photos you can take from up there? The helicopter ride costs 90 euros ($100) per person, a small price for the views it offers and the short travel time. 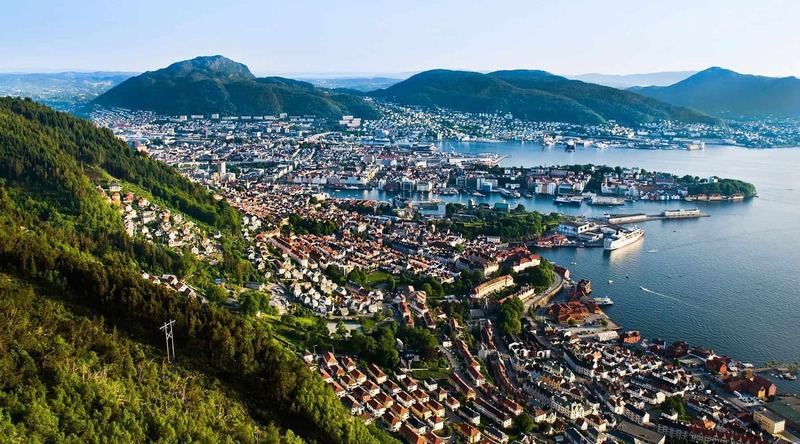 In between visiting all those amazing places in the hart of nature, you should also dive into Norway’s urban areas, and the city of Bergen is perfect for that. Why? 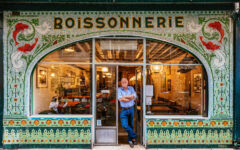 Its center is part of UNESCO World Heritage sites, it has a dynamic cultural life with plenty of art collections and many music venues Its bars and restaurants will make you want to stop at each corner and have something to eat or sip on a beverage. When you’ve seen it all, climb the Mount Fløyen (you can take the Fløibanen funicular) and get your camera ready for some epic views of the city. If you’re in Oslo, don’t miss seeing Bergen as well. Go ahead and get a ticket in what might be Europe’s best train journey. The remote Svalbard, the home of glaciers, polar bears, reindeer and arctic foxes. Svalbard is a huge, wild and unspoiled archipelago between Norway and the North Pole. 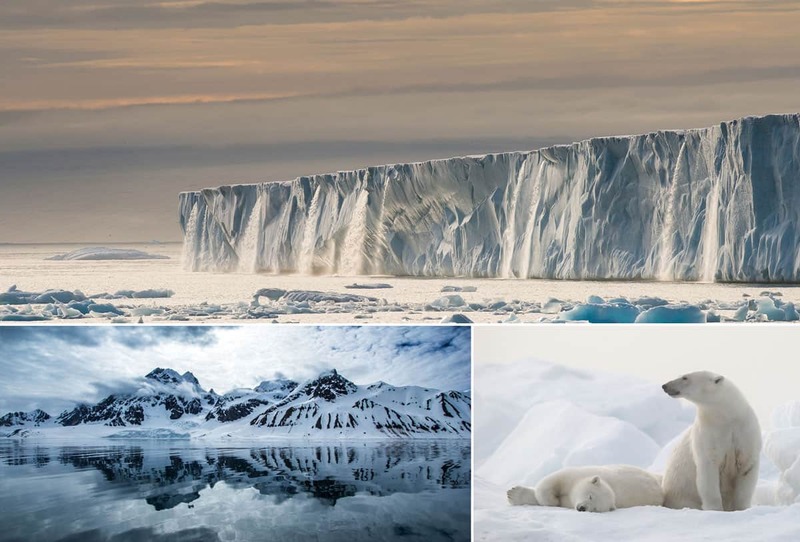 If you really want to see a white wonderland untouched by man, filled with Arctic wildlife, Svalbard’s the place to go. The archipelago has three inhabited islands where you can stay. This is the best place you can photograph polar bears in their natural habitat. A habitat that’s shrinking with each decade that passes by, so here’s a reminder that should be a constant public announcement around the world: Keep the planet clean! Now that you’ve seen some of the most beautiful places in Norway, I’m pretty sure you noticed how clean and well preserved the nature is up north, let’s all take an example out of it, and start caring more about Earth! There are two captions with wrong information: 2. 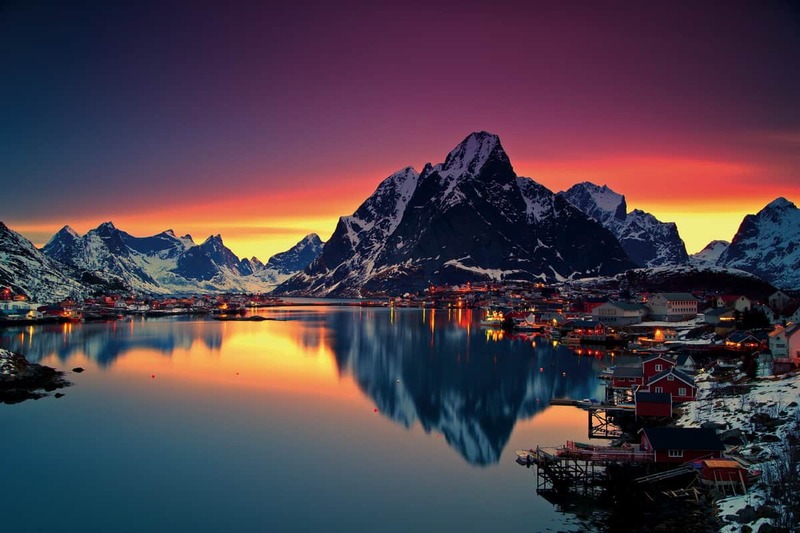 Reine, this photo is from the wintertime! You can easily see the snow, there is no snow in Reine and Lofoten during summer. This is a photo of winter sunset! Picture nr 8 is of the road to the vilkage of Henningsvær in Lofoten. Several hundred kilometers further north than your caption says! You should do better research. 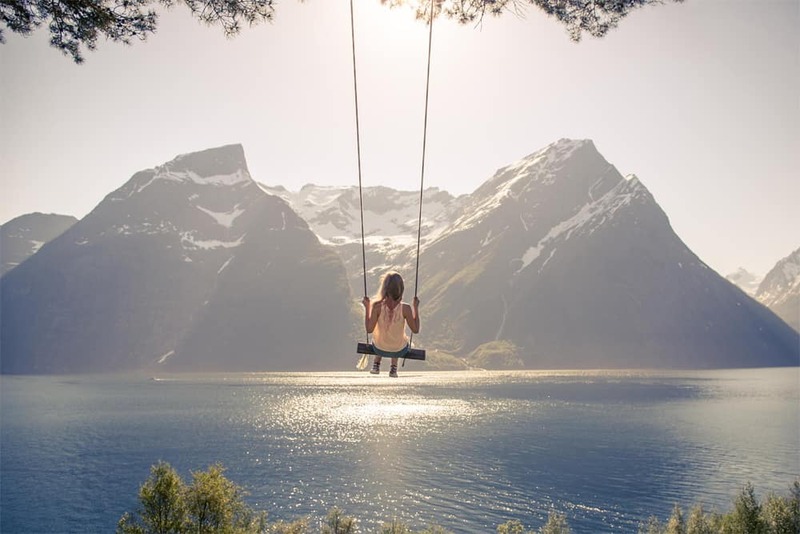 Have you ever been to Norway? The first picture on # 8 is not of the Atlantic road. I know, since I grew up there. This page was very helpful and has such beautiful pictures. Thanks. WOW, thanks so much for sharing!